WHAT: A set from Clover containing Darning Needles and a really handy little pod to carry them in. 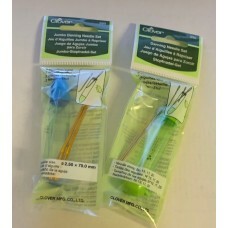 The Green pod contains three Darning Needles sizes 13, 17 & 20. The Blue pod contains two jumbo Darning Needles measuring 70mm long with a bent tip.